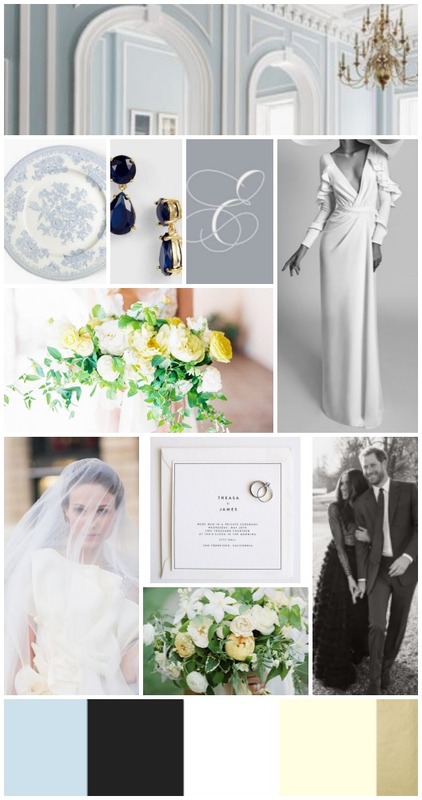 I love sharing the inspiration behind an event, a wedding, a party or a photoshoot. I love sharing the ideas that went into creating the finished product so that you can see all of the details that inspire us along the way. From fabrics, flowers, interiors, fashion, celebrities, stories, travel, there are SO many things that I see every day that inspire me to create an event. As an American wedding planner living in London, this shoot in particular was such a fun one to put together!Coming to Wedding Chicks today and with the Royal Wedding tomorrow, this is the perfect time to share. It was such a wonderful story to colloborate on. 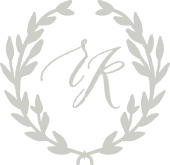 I created a group of suppliers that were all very excited about the idea and could see the vision so well, which is what doing a styled shoot is all about. I wanted to create something pretty and fresh, but not to feminine and nothing to trendy. 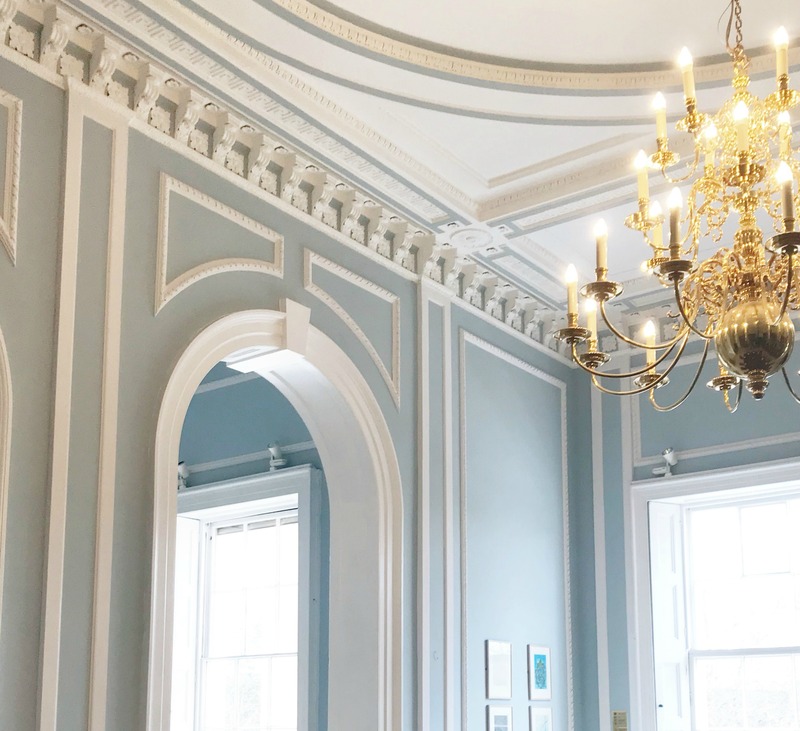 The gorgeous room at 10-11 Carlton Terrace inspired me to use robins egg blue with touches of yellow and black, white and gold. 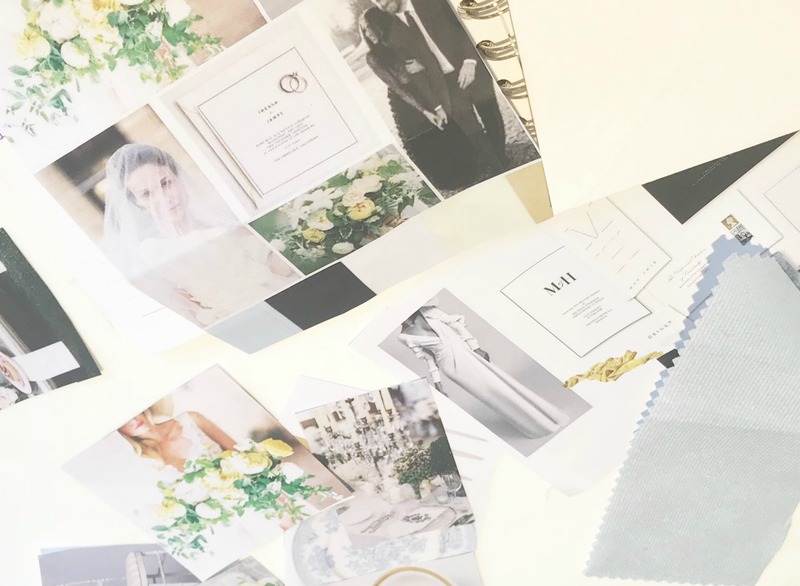 From the flowers to the details of the stationery, the above mood board I created helped guide me through my creative process when I planned. Ali with Bloomologie UK couldn’t have created something more perfect with the flowers. For all of my events whether a birthday party or a wedding, I like to incorporate meaningful details, as well as making it pretty. I had put together a story behind everything from Meghan’s bouquet to the table arrangement. Meghan is initially from sunny California, where the state flower is a poppy, these were sprinkled throughout many areas. The daffodil is a symbol of Wales and Harry is the Prince of Wales, there are just a few in yellows and whites popping throughout, a bit of a secret. The gorgeous english roses are Englands country flower, the rose, which is ofcourse hugely important to Harry but also the two of them will call home and be such a huge part of their together. Ali also incorporated fresh blossoms that bloom frequently around Kensington Palace, their new home together and the season of Spring, when they are getting married. When it came to a meal together, I thought breakfast was the perfect selection. In the UK you often refer to the meal your guests have after the ceremony as the Wedding Breakfast, even if it is served in the afternoon. The meaning of this is that it is the first meal together as husband and wife and most people would fast before their wedding ceremony that would take place at church, so the first meal together would be breaking the fast. 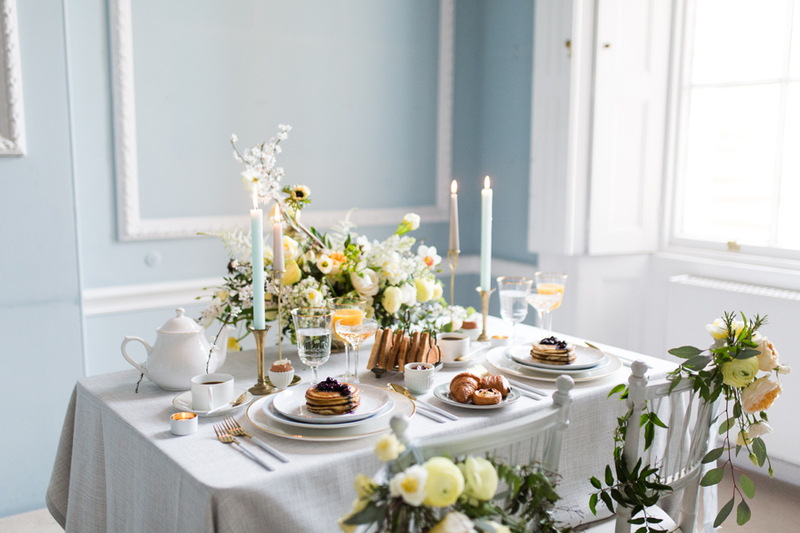 The idea that Harry & Meghan could enjoy a beautiful morning together eating a mix of American pancakes and local Windsor eggs and breads was a dreamy idea to me. All of this happening before the city was really awake. We didn’t leave out a cake or Champagne and made sure that we marked the special occasion with a petite wedding cake that Claire Owens Cakes beautifully designed with flowers that reflected all of the touches in the bouquets I mentioned above. There were so many lovely touches that came together and Cecelina Photography captured it all beautifully! I will share all of the details with you in a few weeks. It was a gorgeous idea to create. Now, I don’t know about you, but I am so excited to see what they truly do for their big day, this was a lovely idea but I think they may have a little bigger celebration in the works.